Bite-Sized: Governor | Wake up, Meeples! Governor is very powerful, largely because of its versatility. You can gain a Gold, draw that Gold, and “remodel” it into a Province, all non-terminally. On top of that, decks that use Governor can benefit from almost every kind of support, because even if the support is something Governor already does, you can free up your Governor plays to do more of the things you have less support for. Drawing cards with Governor is probably its riskiest ability; not because drawing three cards is bad, but because it helps your opponent so much. Because of this, other sources of trashing and/or draw are the strongest support for Governor, and using this ability is best when you plan to end the game that turn. It also gets much better when you have a discard attack to play afterwards. The Gold-gain ability of Governor is a great option in the early-to-midgame, largely because you have the most time to spend those Golds before you eventually turn them into Provinces. 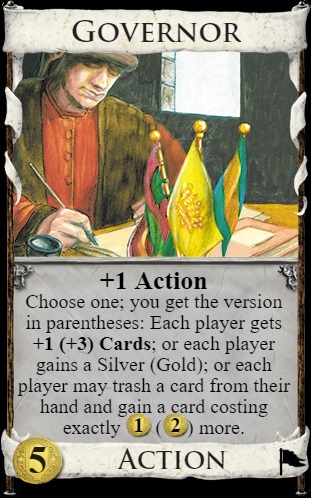 The “remodel” ability is usually best in the endgame, because you’ll want to gain Provinces then, but also because it’s fairly weak early when your opponent can use it to thin Coppers or turn $4 cards into Governors. However, make sure you’re aware of your opponent’s ability to get points from your Governor plays. More detail on Governor can be found in this podcast episode.